GEN celebrates the 10th anniversary of the completion of the public and private efforts aimed at sequencing the human genome. Since its initiation in 1990, the Human Genome Project (HGP) was considered by many to be the biological equivalent of the Space Race in the 1960s. But while space is out there genes are in here, in us, and hopes were immediately raised that a better understanding of the genome would lead to new drugs and diagnostics to improve human health and save lives. While there has been a good deal of success in this area, we still have far to go to completely benefit from what the HGP is revealing to us. But we are well on our way! In our first article, GEN reporter John Russell builds his roundup story around four key questions: Why should completing the human genome project be considered such a historical accomplishment? Did the completion of this project meet expectations? 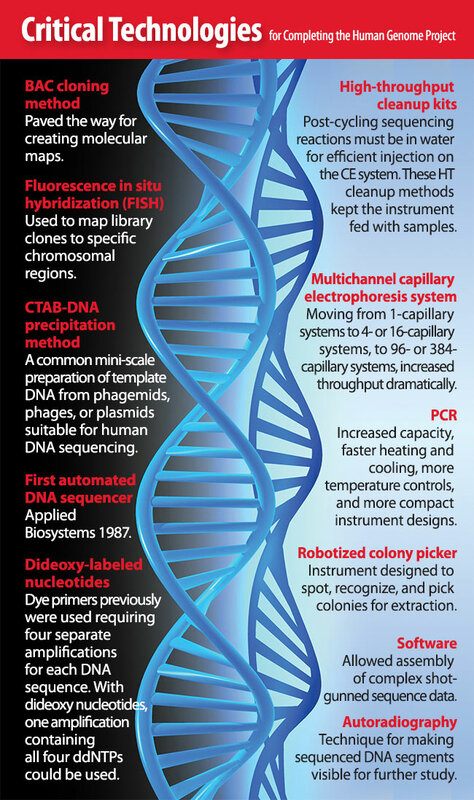 What were the main surprises that have come from studying the human genome? What needs to be done next to advance our knowledge and to capitalize on our understanding of the human genome? In the second article, Constantin Polychronakos, M.D., professor of pediatrics, experimental medicine and human genetics at the Montreal Children’s Hospital, details the advances in genetics made by studying the human genome. He also discusses the novel technologies that have been developed to help unravel its mysteries. GEN wishes to thank Steve Siembieda, vp of business development at Advanced Analytical, for his assistance in helping us create the technology chart above.